Roofing is often a critical part of a building. Buildings owners must be ensured that the solution used for their roof is performant and reliable and will let them without any worries for the next 25 years. Wetsuit® system is a fully integrated roofing system that can adapt to most of typology of projects, from new roofs to existing roofs and to roof repairs. In all case, Wetsuit® system will deliver a high class solution with a high performance in waterproofing and a high fire class. Demonstrating an unbeatable elongation, strong adhesion,..
Wetsuit® complete seamlessness fully encapsulates a roof. Backed by industry leading warranties, and a company that is here to stay. 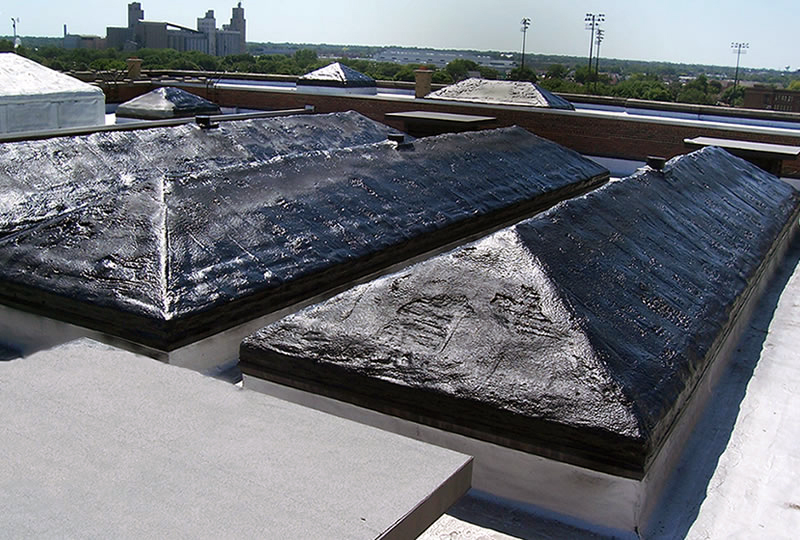 Think of your existing older roof custom fit with a seamless, fully adhered monolithic sheet of rubber over it. This is the WetSuit® Recover System. WetSuit® augments the existing roof’s original strengths, while eliminating its weaknesses. WetSuit® immediately improves wind uplift, fire protection, and water resistance. It provides high puncture resistance and severe hail performance while creating a non-slip, energy efficient surface. Best of all, it is water based, has no volatile organic content (VOC), and is sustainable. Now that is going GREEN! The WetSuit® spray applied, instant set, recover system is a truly unique premium grade product, ideal for virtually all commercial and industrial roof applications. The highly reflective, self washing and sustainable white surface coat delivers building owners significant energy savings year after year. With the highest wind uplift on the market, FM Class I-990, as well as a Class A fire rating and severe hail resistance, the WetSuit® System is in a class all it’s own. Light, durable, and all encapsulating with no seams to fail and a single-pass application, WetSuit® is the rare fix that may just be better than the original. Old “fish mouthed” seams and excessive shrinkage can be quickly remedied by the WetSuit System while improving HVAC consumption up to 50% with the white surface coat. Improved fire resistance. Common system flaws such as cracks, buckling, alligatoring, and penetration flashing failure become irrelevant under the WetSuit monolithic membrane. Wind uplift and fire resistance are improved as is solar reflectance and the damage caused by thermal cycling. Used as a base coat over the SPF and below the white topcoat, WetSuit provides superior puncture and ponding water resistance, UV stable membrane that will protect the foam under the worst of circumstances far after the white topcoat has weathered away. The WetSuit System can arrest and prevent rust while increasing energy efficiency. Questionable seams and fasteners are buried under the monolithic membrane. Ice damning is eliminated. 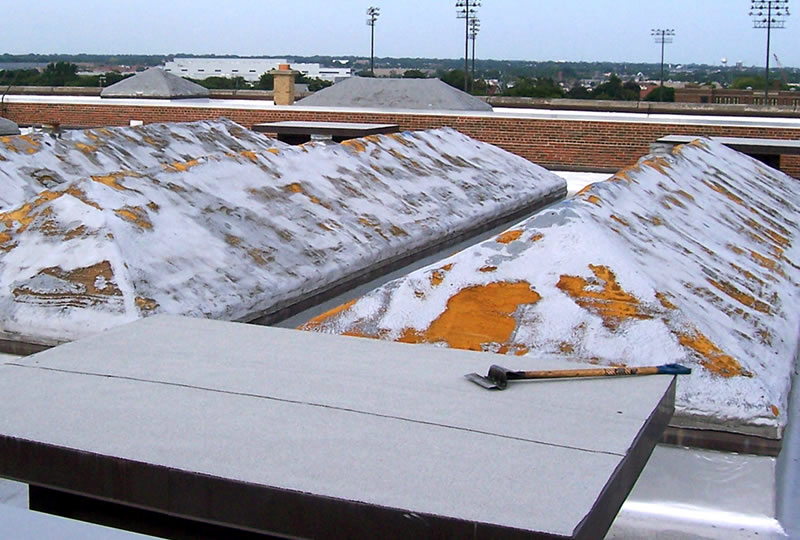 Wetsuit® offers a very convenient system to perform repairs for leaking roofs. Its ability to be sprayed over virtually any substrate and its adaptability to all situation by the use of Wetsuit 1 part self leveling or the specialized trowel grade for patches makes from Wetsuit® the most sensible solution for roof repairing.